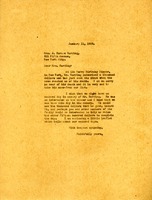 Edith R. Bancroft writes to inform Martha Berry of the death of her sister Martha Worcester and that she is returning the box that was sent to Ms. Worcester. 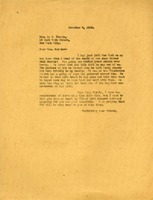 Martha Berry writes to Mr. and Mrs. B. N. Weitman to express sympathy for the death of their son. She assures the Weitman that the doctors in Rome did everything possible to save him, but that his infection was too serious. 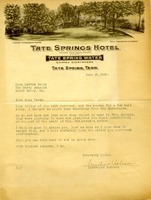 Mr. MacIntyre informs Miss Berry that Mrs. Thomas has died and to remove her from the mailing list. 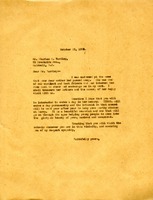 Martha Berry writes to Mrs. Harding expressing her sympathy for Mr. Harding's passing. 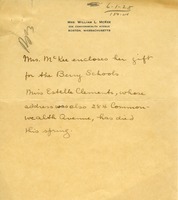 She also suggests that perhaps the money he gave to the school, along with other contributions, could go towards an endowed day in his memory. 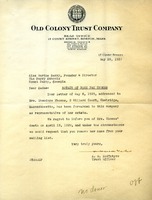 Emily Birlson informs Martha Berry that Mr & Mrs. William P. Bancroft passed away and that she should remove their names from her mailing list. 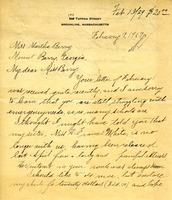 Miss Berry expresses her sympathy for Mr. Yardley's mother's death. 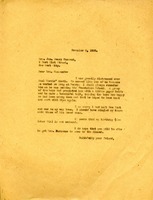 She asks if he would like to endow a day in her memory. 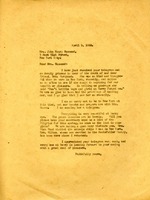 Jessie Dickey, former secretary to John Stambaugh, writes to Martha Berry to inform her that while her letter was received, Mr. Stambaugh died in October and that he will be greatly missed. 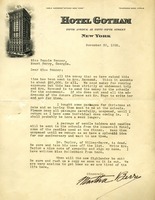 Martha writes to Mrs. Hammond about the death of Noel Morris and how she was saddened over it. 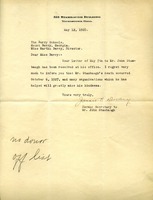 In this letter Martha Berry tells Mrs. Hammond that she is sorry for the death of Mrs. Marquand. She also asks her for a list of Pilgrims for the spring.